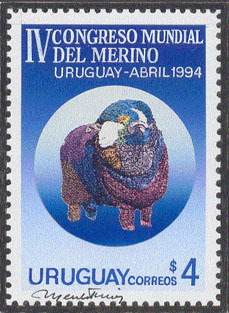 3189 MAQ URUGUAY (1994) Merino sheep*. Original artwork for Merino Wool Congress issue. Watercolor on heavy paper measuring 64 x 88 mm and signed by the artist at the bottom. Scott No 1524, Yvert No 1467. Unique!